When we’re young, we all believe we’re going to live forever. But as we age, most of us realize that’s not the case. What’s more, it becomes clear that the choices we make can have an impact on how long we live. While there are no guarantees or methods that can tell you how many calendars you’ll buy (despite what actuaries say), there are many simple benchmarks that can help predict if you’ll live longer than most. Here are 21 of the most important reasons why you’ll probably live longer than your peerstry not to rub it in. Congratulations! We may be a little late on the wedding gift, but we figure that just the fact that you got hitched is reward enough since you’ll be living longer as a result. A 2013 study by Duke University Medical Center published in the Annals of Behavioral Medicine revealed that being married reduces the risk of premature death in midlife. The study looked at 4,802 people and those that were married through their middle decade were less likely to have an untimely demise. Researchers surmised that the act of having a partner to lean on and work with through any challenges faced in midlife make that era of life much easier to deal with. In a 2015 study, researchers at the University of California, San Francisco discovered that women who are under chronic stress have lower levels of klotho, a hormone that promotes brain and body health and regulates the aging process. Researchers believe low levels of klotho may be linked to an increased risk of accelerated disease development. Additionally, a 2012 study published in the British Medical Journal revealed that risk of heart attack and stroke increase 20% when a person suffers from chronic stress. Your best bet to ward off high levels of the hormone is to try to lower your stress levels. If simple, do-it-yourself techniques like meditation or yoga aren’t helping, you should consult your doctor. Ever have one of those days that you just know you look good? How about a lot of them? Research published in the British Medical Journal discovered that looking young as you age directly correlates with living longer. The 2009 study looked at 1,826 twins and found that the twin who looked older died earlier than their younger-looking counterpart. If the disparity in their appearance was large, the older-looking twin was even more likely to die earlier than if the difference was smaller. What does this mean for you? Looking young and healthy is a great determining factor to living a longer life, so make efforts to look and feel healthy and, ultimately, you’ll live longer as a result. You may take your friends and family for granted sometimes, but the truth is they’re a big reason you’re going to live a long, healthy life. Researchers at Brigham Young University discovered that social isolation and loneliness can be as life threatening as obesity. The study, published in 2015 in Perspectives on Psychological Science, indicates that feelings of being alone impact on people of all ages and can be a precursor to premature deatheven in individuals under 65. The study authors believed that their findings ultimately prove that more positive psychology means better overall healthemotionally and physically. Wheat, barley, ryewhole grains like these deliver essential nutrients that have life-lengthening benefits. Among those nutrients are polyphenols. A 2013 study sponsored in part by the United States National Institute on Aging and published in the Journal of Nutrition found that older adults who had the highest concentrations of polyphenols in their urine (and thus the diets richest in these micronutrients) had a 30% reduced mortality compared to those with less. Additionally, a 2015 study with more than 360,000 participants and published in BMC Medicine revealed that higher consumption of whole grains was associated with a lower risk of death from cancer, cardiovascular disease, diabetes, respiratory diseases, and other causes. Even if you have never trained for a marathon and don’t exactly live in the gym, you may outlive the folks that do just because you jog. The ideal amount of running a person should strive for when it comes to living a long life is 60 to 144 minutes weekly, split into three jogs, according to a 2015 study published in the Journal of the American College of Cardiology. The 12-year study tracked 1,098 healthy people and found that making this simple commitment was more effective than running for lengthier, more intense periods. “People overestimate how much time they need to devote to physical fitness in order to live a long, healthy life,” says Michael Seril, a National Strength and Conditioning Association and American Council on Exercise-certified personal trainer based in Whittier, Calif. If a Netflix binge sounds more appealing than a night out, you won’t like this one. Researchers at the University of Cambridge discovered that your social life is a great indicator of how long you’ll live. The 2010 meta-analysis published in PloS One indicates that social isolation is a detriment to our health. In fact, people who have a healthy social life are 50% more likely to outlive the local hermit. For a little perspective, these findings mean that social isolation is comparable with other mortality risk factors like smoking and alcoholism, and exceed the risks associated with obesity and physical inactivity. Having a big belly can almost double your mortality riskeven if your body mass index falls within the “healthy” range, according to a 2008 study published in the New England Journal of Medicine. The study, which looked at more than 350,000 people in Europe, found that having greater than a 47.2-inch waist for men and a 39.4-inch waist for women doubled the risk of premature death compared with people who had smaller waists. This may sound like a trick question, but do you feel like your life has meaning? Think carefullyyour answer might dictate how long you live. According to research published in Lancet, people who believe their lives have more purpose live longer than those who don’t feel a clear sense of meaning in life. The study looked at nearly 9,000 people and ranked them according to four categories on a range of personal wellbeing from highest to lowest. The results were intriguing: People who felt they had more meaningful lives outlived their peers who did not. People in the lowest category in the study had a 29% mortality rate in an eight-year span while those with the highest sense of purpose had only a 9% mortality rate. If you figure you’re not in that latter category, bring some meaning into your life: Volunteer, get a pet, start a project, or find that special something that makes feel like you’re making a difference. People who’ve lived to 100 tend to have the same personality traits in common: They’re conscientious, extraverted, and open, according to a 2006 study published in the journal Age. Researchers speculate that conscientious people are more self-disciplined when it comes to diet and exercise and less likely to smoke and drink. Meanwhile, an extraverted personality is associated with optimism, which translates to lower stress levels. How long did your grandparents live? Chances are that if they lived well into their golden years, you have a very good chance of living long too. According to a 2010 study published in the journal Science and updated later in PloS One, healthy aging can be based on two important factors: Genetics and environment. The original study looked at 1,055 centenarians (people who lived past 100 years) and 1,267 controls and found that they could predict long life with almost 60 to 85% accuracy. How? Apparently genetic markers and variants help dictate longevity in spite of environmental factors. While the study does not say if these genes can be passed down, it does lend some credence to the idea that if your grandparents lived a long life, it may be in your blood to do so as well. Obese people who have a BMI of 35 or higher have a 29% increased risk of death over normal-weight individuals, according to a 2013 review of more than 100 studies published in the Journal of the American Medical Association. This report also made headlines for a shocking revelation: people who are overweight (but not obese) may live longer than normal-weight individuals. Still, this news doesn’t give you permission to pack on extra pounds. Being overweight still increases your risk of chronic conditions like heart disease and type 2 diabetes. Averaging more than one alcoholic drink a day for women and two for men increases risk of cancer, liver disease, and heart diseasebut having just a little bit of booze each day may actually extend your life. One Dutch study found that having slightly less than one daily serving of wine, beer, or spirits was associated with a 36% lower risk of all causes of death and a 34% lower risk of cardiovascular death. Similarly, a Spanish study of 15,500 men and nearly 26,000 women found that long-term moderate drinking decreased risk of heart disease, especially in men. According to research from the University of California at San Diego School of Medicine and the American Cancer Society, it seems the sweet spot for sleepand living a longer life as a resultis to get about seven hours of shut eye every night. The study, which was published in the British Medical Journal, looked at 1.1 million adults between 30 and 102 years old over a six-year period and found that people who slept for eight hours or more each night or less than four hours died earlier than those that slept somewhere in between. Shockingly, even people who slept only five hours each night on average lived longer than the folks who snoozed for eight or more. The best survival rates found in the study were for subjects who averaged seven hours each night. The lesson: Get yourself up to seven hours and you’ll be your best every morningand have a lot more mornings to look forward to in the process. A seafood-rich diet supplies you with heart-healthy omega-3 fatty acids, which might help lengthen your life. A study published in the Annals of Internal Medicine looked at more than 2,600 adults and those who had the highest omega-3 blood levels reduced their overall risk of death by 27%, and even had a 35% lesser chance of dying from heart-related issues. “Aim to eat about 7 ounces of fish on a weekly basis for greater overall health,” suggests Chicago-based dietitian Jenny Westerkamp, RD. Maybe you were a late bloomer, or maybe love hit you a little later in life than you had planned. If you gave birth to a child after the age of 33, chances are you’ll live longer than your friends who had their last child by age 29. A 2014 study published in Menopause: The Journal of the North American Menopause Society looked at 551 families and found that women who gave birth later in life lived longer. In fact, women who gave birth after age 40 were four times more likely to outlive those who delivered a decade earlier. According to research published in the journal of the American Academy of Ophthalmology, taking care of your peepers reduces your risk of mortality by a whopping 40%. Head researcher of the study, Jie Jin Wang, PhD, believes that the link between living longer and cataract surgery is likely attributed to better mobility, improved physical and emotional well-being, overall optimism, and greater confidence living after besting visual impairment. If your dad was the oldest on the block, you should call him up and thank him for waiting so long to bring you into the world. Having an older father is a good indicator that you’ll outlive your peers, according to research published in the Proceedings of the National Academy of Sciences. What does this really mean for you? If your dad reproduced when he was older, that means his life and environment were more favorable than his ancestors, which is a good precursor to your ability to live longer. Why? Simply put: If his life was better, yours will very likely be even better than his! One of the main reasons you’ll be outliving most of your best friends is simple: You don’t smoke. According to the CDC, people who never got into the habit of smoking live about 10 years longer than their tobacco-loving counterparts. But if you did partake in some puffing when you were younger, you’ll still outlive the diehard, never-quit smokers if you ditched the habit before you hit your midlife crisis. Why? Because your risk of dying of smoke-related disease decreases by 90% just by quitting before age 40, according to findings published in the New England Journal of Medicine. Measuring the power of prayer has long been a point of contention for many in the scientific community. But in a 2011 study published in the Journal of Religion & Health, researchers looked at more than 92,000 women, including smokers, drinkers, and women who exercised (and those who didn’t). Regardless of unhealthy or healthy habits, the study found that people who attended one religious service each week were less likely to be depressed than those who did not. Since depression can impact longevity, such attendance might help. And a 1998 study published in the American Journal of Public Health found that elderly community residents who regularly attended church services lived longer than those who did not partake. 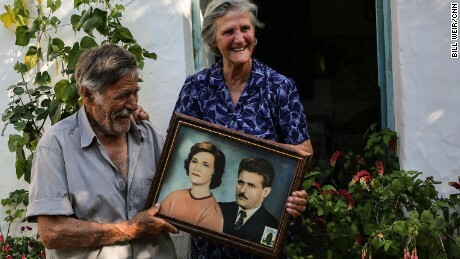 This entry was tagged 21 ways to live a longer, fuller life - CNN.com, Health. Bookmark the permalink.